Settlement with nearly 4,000 inhabitants 26 kms from Budapest on the edge of Zsámbék basin, in the north-eastern part of Fejér county. 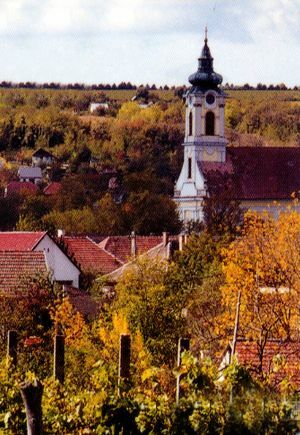 As a result of centuries-long viticulture, Etyek has recently joined Hungary's historic wine-districts. The Törley champagne of Budafok and the more and more popular wines of Etyek are made from the grapes grown on an area of almost 800 ha. Sights: Magyar-kút, the stations of the Cross, the Circle of wine cellars, the row of cellars of Kecskegödör, the Catholic church, the chapel of Bot, the renovated statues and the new nursery school. Outstanding events: the Cellar Festival in May, the patronal festival on the first Saturday and Sunday of July and the Kezes-Lábos (Hands and Feet) Festival in September.